A near-Earth object (NEO) is a Solar System object whose orbit brings it close to the Earth. Their least distance from the Sun, their perihelion, is less than 1.3 AU. NEOs include near-Earth asteroids (NEAs) and near-Earth comets. They include more than ten thousand near-Earth asteroids (NEAs), near-Earth comets, some solar-orbiting spacecraft, and meteoroids large enough to be tracked in space before striking the Earth. Collisions in the past have had a significant role in shaping the geological and biological history of the planet. In some cases NEOs hit the Earth. Most of these meteors explode harmlessly in the upper atmosphere. But some NEOs are dangerous. We try to find out when one is going to hit Earth using impact prediction. On 30 June 1908, a meteorite of around 45 metres in diameter exploded over the basin of the Podkamennaya Tunguska River. It released an energy of 10–15 megatons of TNT and destroyed roughly 2,000 square kilometres of forest. Such an explosion, similar to one of the biggest nuclear weapons, could have razed London about as far out as the M25 ring road. However, because the location was remote, no deaths were recorded. The Association of Space Explorers estimates that a Tunguksa-like event happens two or three times every thousand years on average. An asteroid roughly 10 km in diameter is thought to have hit Earth 66 million years ago and caused the K/T extinction event, including the extinction of all non-avian dinosaurs. 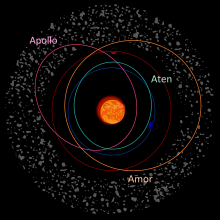 ↑ An astronomical unit (AU) is the semi-major axis of the Earth's orbit. That is the longest distance of the Earth from the Sun. ↑ 2.0 2.1 "NEO Groups". NASA. Retrieved 2014-09-03. ↑ Richard Monastersky (1997). "The call of catastrophes". Science News Online. Retrieved 2007-10-23. ↑ 4.0 4.1 "Asteroid threats: a call for global response" (PDF). Association of Space Explorers. 2008. Retrieved 2014-09-03. This page was last changed on 28 August 2018, at 20:40.